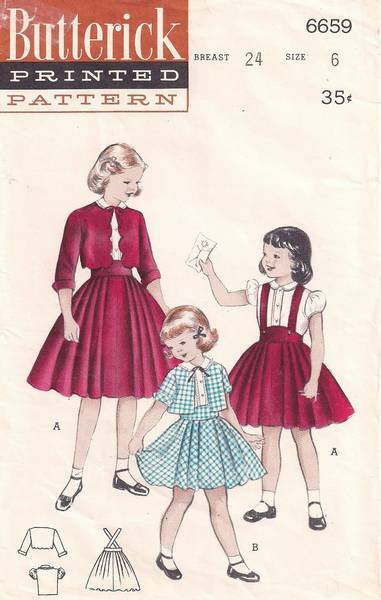 Original vintage Butterick 6659 sewing pattern. 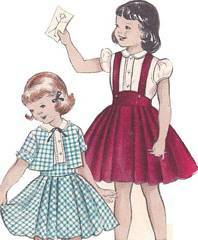 Suspender skirt has a wide waistband and unpressed pleats. Short-sleeved blouse has Peter Pan collar with optional lace edging. Bolero, with optional scallop detail, has short or 3/4 length sleeves. Girls' Size 6, Breast 24, Waist 22, Hip 26. Pattern is used and complete. The pieces have been carefully cut and neatly folded. The envelope is in very good condition. One archival tape mend on the upper right.